This article has gone viral and it was shared with me by a friend on LinkedIn. I find it so funny, and I wanted to share it here. I remember the first exercising of my schoolboy German when I wanted to order Liver and Chips (Leber und Pommes Frites), but instead said Liebe und Pommes Frites (Love and Chips). Hahahaha – that is funny too Chris, love it! Hahahahahahaha – how old were you? Hahahahaha – oh you’re funny! That was so funny thanks for sharing. This is way to funny! Oh my. Way to funny! That IS so funny! Thanks for sharing! By d way – Who r u? 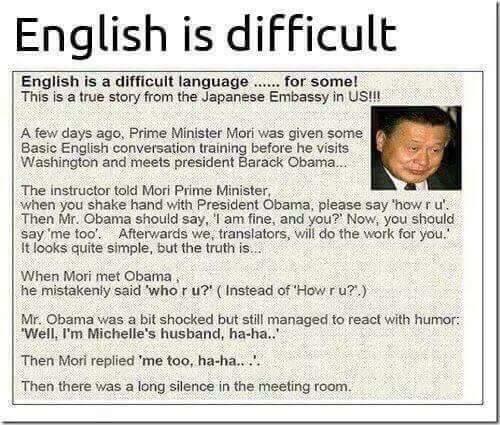 Hahahaha, “me too”- I am someone who finds English difficult too.